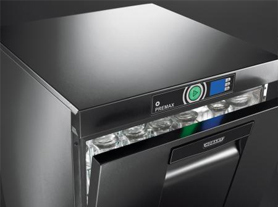 The Offenburg-based dishwasher manufacturer HOBART is going to launch a number of innovative products in March 2013. The world market leader in commercial dishwashing technology will present the new, intelligent generation of glasswashers and undercounter dishwashers. In a world first, HOBART will introduce the ENERGETIC Drying System in the PREMAX GCP compact glasswasher. This system makes the manual drying and polishing of glasses a thing of the past. The use of innovative and intelligent technologies has made the PREMAX and PROFI models more economical than ever. At the same time, the technical innovations ease staff workloads and produce even better results. HOBART is therefore introducing its intelligent dishwashing technology in its undercounter range. With the introduction of the new, intelligent wash water control system, HOBART reduces still further the already low consumption values of its machines. This technology, unique in the market, constantly monitors the level of dirt in the wash water and adjusts the amount of rinsing water according to the amount of dirt present. This means that the PREMAX FP only needs 1.0 l of fresh water per cycle. The overall consumption of water, chemicals and energy is reduced by up to 60% compared to conventional use. The PREMAX FP and PROFI FX dishwashers are also available with the optional intelligent double rack system, which doubles the capacity and therefore saves 50 % of water, energy and chemicals compared to conventional use. In this system, a cup rack is washed underneath while a second rack of plates and cutlery is washed above. This makes the best possible use of the full power of both the lower and upper wash systems. The new, intelligent VISIOTRONIC Control System enables the machines to be operated in a simpler, more intuitive way. Key items of information, such as the programme status or warning messages, are displayed at all times – both in the form of symbols and clear text. In addition, further information such as temperature, number of wash cycles or operating data can be accessed quickly and conveniently. The display is activated via a motion sensor when an operator moves a hand towards it. HOBART has also improved the ease and convenience of cleaning the machines: the new CLIP-IN Wash System allows the wash and rinse arms to be removed quickly for cleaning, using one hand and no tools. With its new PREMAX and PROFI models, HOBART offers catering establishments and hotels dishwashing solutions that are as economical as they are thorough and effective and that cater for every need. For washing 600 x 400 mm racks and plates, the PROFI FXL with its extra internal chamber depth is the ideal choice. In the PROFI GX low body, HOBART also offers a variation on the PROFI GX glasswasher, whose compact design and integrated reverse osmosis system mean it can easily be located under any counter. As more intelligent the machine, as easier is the life of the operator.